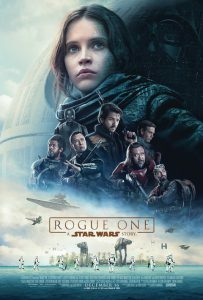 Rogue One: A Star Wars Story is the eighth Star Wars film and every new film from a galaxy far, far away, is a landmark event in nerd culture. Guest, Nicole Davis from Geek Cinema Society joins Claire and Kyle as they draw historical parallels to the events of Star Wars and discuss Disney’s growing empire of acquired intellectual property. Claire focuses in on the incredible life of spy and French Resistance fighter, Nancy Wake and her struggle against real life stormtroopers in World War II. Kyle takes us through Disney’s acquisition of Lucas Arts and the influences and process of director Gareth Edwards. Nicole and our hosts conclude with their thoughts (and feelings) on the film and the franchise.